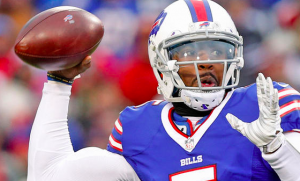 After two straight losses, the Buffalo Bills have apparently lost faith in quarterback Tyrod Taylor. Following last week’s 47-10 loss to the Saints, their first home loss of the season, the Bills are benching Taylor. Head coach Sean McDermott announced Wednesday that rookie Nathan Peterman, who the Bills took in the 5th round of the draft this year, will make his first career start Sunday against the Chargers. McDermott said following Sunday’s loss that Taylor would remain the starter. However, the first-year head coach has had a change of heart since then. With the Bills sitting at 5-4 and currently holding the final wild-card spot in the AFC, McDermott is putting his trust in a rookie quarterback to get the job done. Taylor is obviously not a Pro Bowl level quarterback. But he’s having arguably the best season of his career. He’s thrown 10 touchdown passes and limited himself to three interceptions this season. He’s also a constant threat to pick up yards as a runner. However, getting the Bills to 5-4 at this point of the season hasn’t been enough for McDermott. Peterman, of course, made in NFL debut last week. In garbage time against the Saints, he was 7 for 10 for 79 yards and a touchdown. However, it was enough for McDermott to think that Peterman is ready to be Buffalo’s starting quarterback. Despite benching his quarterback, McDermott did his best to pick up Taylor just in case the Bills need him later in the season. However, Taylor was understandably disappointed and upset at losing his starting job. For Peterman, this is obviously a great opportunity to prove that he can be a starting quarterback in the NFL. For Taylor, the move creates great doubt about his future in Buffalo. He has just $1 million guaranteed on his contract for the 2018 season, so he could be on his way out of town if Peterman retains the job for the rest of the season. Perhaps most importantly, the move is a huge one for McDermott in his first season as a head coach. If the Bills go on to make the playoffs, he will be universally applauded for the decision. But if Peterman struggles and the Bills fall out of the playoff picture, McDermott will be second-guessed all offseason.